It’s the day after Thanksgiving. Some may call it Black Friday. Not me. I’m so glad to be in the comfort of my home, sipping my Maxwell House Master Blend coffee with International Delight Coldstone flavored creamer, relaxing beside my black iron boxwood stove generating that blessed heat, and listening to the soothing sounds coming from the cage in front of my kitchen window. Muffin, my zebra finch, is serenading the rising of the sun. While the rest of my tiny part of the world is in a shopping frenzy, I am completely lost in the little things. The simple pleasures. Yes, today I’m thankful for the little things in life. Because today is another day. A new day. Truthfully, I am very tired. I got a flu shot Monday. On Tuesday I got the flu. This has never happened to me before. My common sense tells me I’ll never get another flu shot again. I keep asking myself, “How could this possibly be a good thing?” I’ve been keeping myself medicated with over-the-counter flu medications because I was not about to cancel Thanksgiving dinner with my family. No way. If you read my last post, Thanksgiving is my favorite holiday. I may not have felt my best, but I determined in my heart to live in the moment. This hasn’t just been a physically draining week, though. It’s also been emotionally challenging. Some things have happened to cause great sadness in my spirit. Big things. Difficult things. Hard things. Messy things. Things that affect the quality of life. Not mine personally, but people I care about. Disease. Death. Damage. What do you do when your heart is broken for the Broken? What do you do when your soul is downcast for the Downcast? What do you do when your spirit is crushed for the Crushed? When how could this be a good thing? rings in my ears I am comforted by these words from the prophet Isaiah. They proclaimed the role and purpose of the coming Messiah. During Christ’s ministry on earth, He opened the scrolls and read these words in the synagogue, fulfilling this prophecy. Now that He’s in heaven sitting at the right hand of the Father and His Spirit lives and breathes in me, I can now minister in His name and in His power just like this. To the broken. To the downcast. To the crushed. In the darkness. In the prisons. In the ashes. That’s how I do it. When the ugly things rear their nasty heads, I tend to appreciate the little things all the more. The simple pleasures. I refocus because I don’t want to miss what’s right with the world. I don’t want to miss what’s good. I don’t want to miss the faithfulness of my God in the ugliness of life. I don’t want to miss the Spirit of Christ in this coming season. I want to keep my eyes on Him. I may not be so young anymore. I turned 57 on Sunday, but I had a few difficulties of my own as a child. As an adult, I can now see the good that has come from bearing the yoke when I was young. In the midst of the ugly, I still see the beauty of Christ and that is such a good thing. 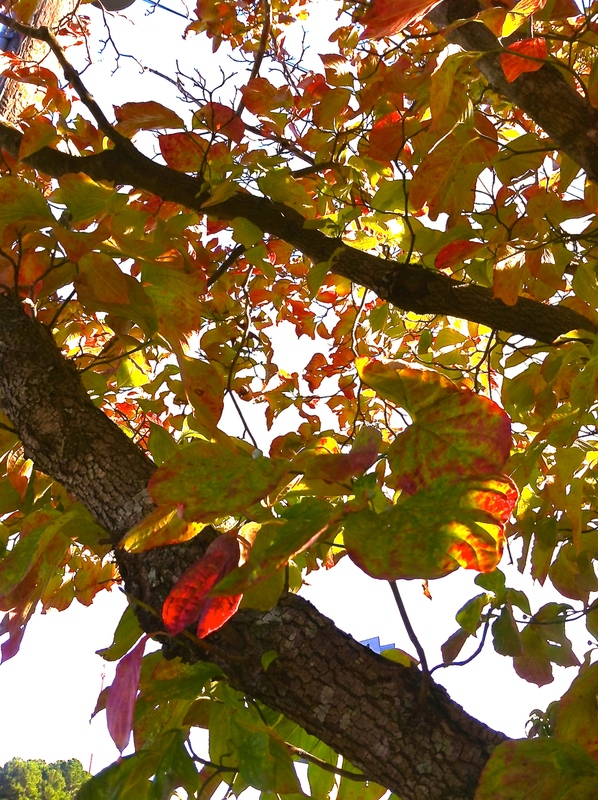 I can recall to mind so many wonderful, beautiful things that have happened and they greatly outshine all the ugly. God is so good like that. Full of compassion. Full of mercy. Full of grace. It’s not suppose to be a hard thing to grasp for the heart that truly seeks. I don’t think it’s meant to be difficult. I think Jesus wants it to be simple. Yes, I’m tired, but honest-to-goodness, I’m oh-s0-thankful for the little things. And maybe, just maybe, I can learn to be thankful for flu shots again because they really are a good thing. As many times as I’ve had one, I’ve never gotten the flu before…until now. 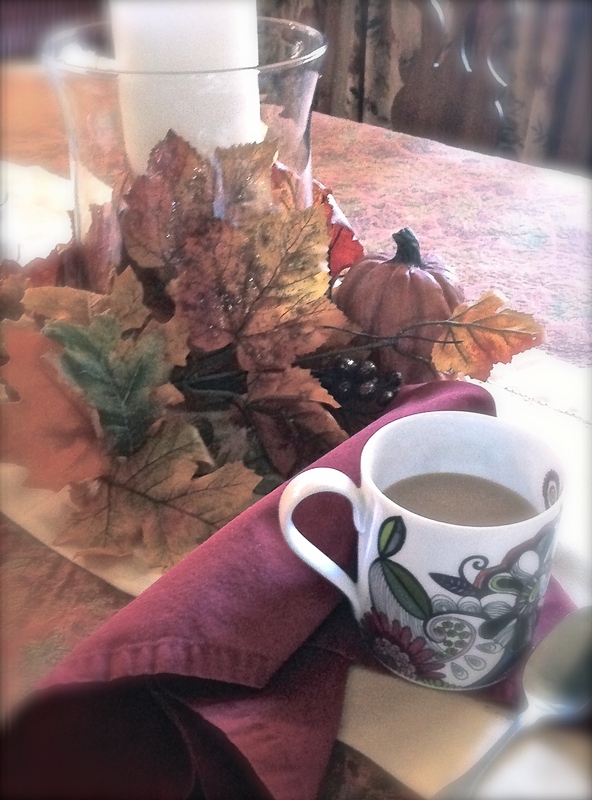 As Muffin continues to fill my kitchen with her song, I’ll determine to live in this moment and give thanks for God’s simple pleasures…drinking from the cup of His blessings, warming myself in the Light of His presence, and listening to the soothing sound of His voice. It’s another day. A new day. And I am still very thankful. November is my favorite month of the year. It’s the month my mother gave birth to me, the day God chose to bring me into this world. Sometimes my birthday even falls on Thanksgiving Day. But, that’s not the real reason Thanksgiving is my favorite holiday. I have fond memories of spending the holiday with my paternal grandparents and my father’s family. It didn’t matter whether my birthday fell on Thanksgiving Day or not, my grandmother always had a birthday cake for me. I learned early in life that Thanksgiving was all about giving thanks and treasuring family. This was a happy place for me. Twelve years ago, something memorable happened to me in the month of November. I had brain surgery nine days before my birthday. Thanksgiving took on a whole new meaning for me that year. I may not have been able to spend any time at all on preparations, but I never felt so loved, so grateful, so safe. Surrounded by my family, I knew in my heart that I had been given a great gift…life. God had preserved my life. One year later I would come to understand that not only is life a gift, life is hope. Hope, the joyful and confident expectation for a certain thing to happen, like eternal life. The indescribable gift of life forever with my God, the Giver of every good and perfect gift…with Jesus, the Keeper and Sustainer of my heart. One year after brain surgery…in this beautiful, wonderful month of thankfulness that I love…the day before I would celebrate my 46th birthday…my friend, Leslie, passed from this earth and entered into her heavenly home. Her brain surgery had been one month before mine. She spent a month in the hospital. I spent four days. Her tumor was malignant. Mine was benign. She grew weaker. I grew stronger. She endured radiation and chemotherapy and then, sadly, hospice came. I went to visit Leslie four days before she passed away. Her husband had warned me not to be disappointed if she didn’t respond to me. The pain medications were keeping her sedated, but God in His infinite grace and lovingkindness gave me the most precious gift. Leslie lit up and responded to my presence. I told her stories. She listened. I laughed. She giggled. I held her hand. She held mine back. I prayed for her and watched tiny little tears fall from the corners of her eyes, trickling down behind her ears as she lay back on her pillow. I kissed her forehead and told her I loved her. Then, I said good-bye. Her mother-in-law walked me to the porch and told me that Leslie had come “alive” for me more than most people who visited her in those last days. I think I know why. We shared a common bond. Brain tumor. Brain surgery. Though we suffered afflictions–Leslie’s were oh-so-much-more than mine–we knew the process of enduring, of proving our character, of producing hope. I still witness the reaction of others when I tell them I had brain surgery–jaws drop open. Hearts race. Fears rise. I had once asked Leslie in the midst of her chemotherapy treatments and radiation, “What is the one thing you fear more than anything?” She didn’t hesitate. There was no fear for herself, only for her sons. I got that. Before my surgery, I had pondered similar fears. Oh, the depths of a mother’s love. Sometimes life is so very sad, but in the sadness we come to experience new ways of relating to our heavenly Father. I came to understand hope in a way I never had before. For several years after Leslie’s death, every November I became melancholy. Maybe not so much in sadness as in deep reflection. Why does God increase the days of one life and not another? I’m convinced God wanted Leslie in heaven with Him. She was ready to meet her Maker. There’s no fear in that. Only hope. The best way I can honor Leslie’s life is to live mine well. …where there will be no tears. No pain. No sadness. No sickness. No death. No more good-byes. 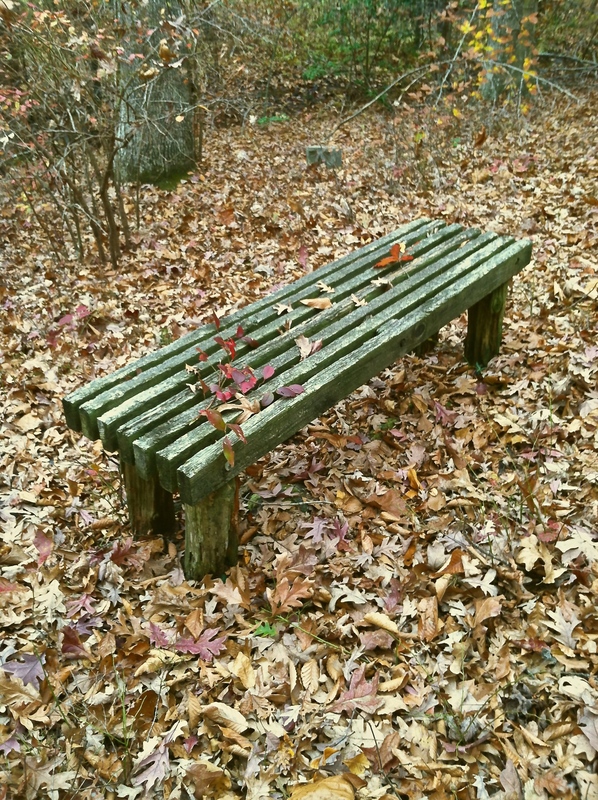 There’s this sweet little bench in the woods across the street from my parents’ house. It sits on a little hillside overlooking a creek bed. The skunk cabbage grows in abundance along the marshy stream and the ground beneath my feet is rich and soft. It takes some meandering around brush and fallen tree logs to get to this bench, but I’ve always been very fond of a walk through the woods. This is one of my favorite quiet places in my little part of the world. I guess what I find so welcoming about this place is that it’s not frequented by the rest of the world. I don’t know that anyone else ever visits. I don’t know that anyone else really cares it’s there. I don’t know that anyone else sees it for the treasure that it is. It’s just an old bench sitting on a hillside in the woods. Left to decay. Forgotten. Forsaken. I’ve known of this bench for many years. It was built by a loving father who spent many days and many hours working the land where one day a house would be constructed by his daughter and her family. The father passed away and the land was no longer tended. Just a few years ago the daughter passed away, too. I don’t know that a house will ever be built there. The sadness is too great for the family and what was once a great dream may now be just a memory. I’ll never forget the first time I ventured to my bench. I was heavy in heart. I needed a quiet place. I was visiting my parents and I remembered how I used to love a walk through the woods as a child. How often did I escape to the forest and lose myself in its solitude, sitting on a mossy bank or perching myself on a fallen log? I don’t know, it just gave me peace. What can I say? We all need a quiet place and in this crazy-mixed-up world, we don’t always know where to find it. So, I made my way to the bench in the woods that day and I sat. I talked to God. No distractions. No interruptions. No one to hear, no one to see. Just me and God. All alone in the woods. And before I knew it I was weeping. I knelt in the rich, soft earth beside that bench and I cried my little heart out. I didn’t care, but I knew in that place that God did. What’s a quiet place if God isn’t in it? I think sometimes we’re afraid of the quiet places. We’re afraid of solitude. Instead of embracing it, we flee. We keep ourselves so occupied, so busy, so distracted that the silence becomes elusive. I think I learned early in life, though, that silence really is golden. In some ways, my hearing disability is a blessing. Maybe that’s why I loved a solitary trek through the woods even as a young girl. Maybe that’s why I love my bench. I’m not afraid of the silence. I want it. No…I need it. Because it’s there in the silence that I find my confidence. I want to experience the peace that comes in waiting on the Lord. I want to be confident in my waiting seasons. I want to experience the blessed truth that God will never leave me to decay. I am never forgotten by the One who treasures me. I will never be forsaken by the One who promises to be with me wherever I go. There is such a connection between faith and quietness. There is such beauty in learning how to trust that even in the silence God is present. …it’s my quiet place. It’s where I know I’m not alone even in the desolate places. To the rest of the world it may be a place of decay. Forgotten. Forsaken. Sometimes, silence isn’t just golden. It’s God. This blog post has been in my draft queue for weeks. To be honest, I’ve not really known how to write it. 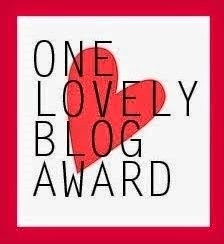 I’ve done a bit of digging into the purpose of the One Lovely Blog Award and I’ve come to the conclusion that it was created to give bloggers encouragement and support in the world of blogging. Heaven knows we all need encouragement, especially in a “world” where it’s easy to get lost in an ocean of faces, where diversity is as wide as the ocean is long, and hope for acceptance as fierce as its rolling waves. 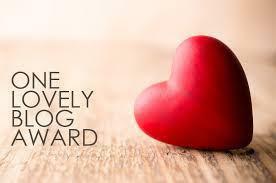 This award is a “pay-it-forward-kind-of-award.” I was nominated by another blogger and I, in return, will nominate 7 more and I’ll share 7 things about myself that you may not know. To be honest, I started my blog a year ago completely ignorant to the ways of the blogging world. I just wanted an outlet for my thoughts, but because I love to write (and read) it would be so easy to just sit at my computer reading blogs all day long. I could lose myself in other people’s stories and writing styles. There are some amazingly gifted and talented writers out there with some very inspiring stories to tell, but I believe that most bloggers just blog for the love of writing. They have all this passion bottled up inside of them and blogging is the way they unleash their knowledge and insight. I’m just one of the thousands. To be nominated by another blogger is huge for me. Her name is Karen. Karen Taylor. She’s the first blogger I connected with when I began my blog in the fall of 2013. She, with her “Rosegardens and Thorns” and me, with “my thorn…God’s glory.” No, I’ve never met her face to face, but I feel like I know her. Karen is Jamaican. How cool is that? To connect with someone across the vast ocean that separates us is one of the coolest things ever. You’ll find Karen at http://taylorkaren.wordpress.com. Her blog is titled, Rosegardens and Thorns. She writes honestly, openly, and sometimes heartbreakingly about her life experiences and struggles. She covers a wide-range of topics. She researches. She journals. She pours it all out. She lives and breathes in the God of second-chances. One of the things I love about her is that she’s an honest-to-goodness-natural-born-encourager. Even though my blog has very few followers, receives very few comments, and has few readers per blog post, Karen continues to lift me up and encourage me to press on. She believes in me. Wow. You have no idea how much this means to me, Ms. Karen. Thank you for nominating me. 1. I try to eat healthy. I don’t consider myself a true vegetarian because I do eat fish. I eat little dairy and go light on the bread. I struggle with a sugar addiction. 2. My father took my family to the Holy Land with a side trip to Greece when I was 20 years old. I had my most spiritual moment of worship ever on a boat in the middle of the Sea of Galilee. 3. The first time I ever learned to fish as a child I caught an eel. I’ve never cared for fishing since. 4. In the 90s (1990’s, that is) I was a self-employed decorative artist. Long before this present craze for chalk paint furniture, I painted furniture the hard way…with proper sanding, primer, 2 coats of paint, hand painted flowers, vines or whatever I was commissioned to do, and 2 coats of sealer. I don’t paint much any more, but at the time I had a lucrative business. 5. I love junkin’…thrift shops, flea markets, antique shops, and the occasional yard sale. I need a bumper sticker that reads, Caution: I Brake For Goodwill. 6. My favorite food is Italian. I would eat pasta or pizza every day if I could, but I don’t. Too much cholesterol and too much “sugar.” My body can’t take it anymore. 7. I ran track in high school. As the second leg of the 880 relay team, we were 2nd in district, 2nd in regionals, and proud to represent our district at the state track meet in 1975. As an adult, I never took up running, though. Walking is my #1 form of exercise. 1. Michele Cushatt at michelecushatt.com. She’s a writer, speaker, author, and storyteller, a wife and mother of 6 children. She’s gracefully transparent and, wow, her life is an amazing testimony to the beauty of God’s grace. 2. Lara Williams at tooverflowing.com. She’s a writer, speaker, and author, a wife and mother of 3 children who tells-it-like-it-is. She shares her heart openly and honestly about her life’s struggles. 3. Sherry French at thesplendiferouslife.com. Isn’t that the coolest heading for a blog? The Splendiferous Life! Love it. And it suits Sherry. She’s one of the most creative women I’ve ever met, a beautifully talented and creative artist, wife and mother of 9 children, both biological and adopted. Her heart is for the orphan and Ugandan missions. 6. Edward Roads at mytwosentences.com. Edward’s posts consists of 2 sentences each. Yes, it’s true. It’s amazing to read what he packs into just 2 sentences full of creative, descriptive words that paint beautiful pictures in the mind’s eye…and, yes, there are even amazing photographs that accompany each post. 7. DevotionalDiva.com. This blog was started in 2008 by a published author who recently passed the editor’s baton to Maggie Winterton, another editor, writer, military wife and mom of 2 children. She helps and guides others in sharing their stories on Devotional Diva. I love this site because of the many guest posts. You never know who’ll be writing, what they’ll be sharing, and how they’ll touch your heart.